CarGurus has 3,033 nationwide RX Hybrid listings starting at $9,795. Back in 2005, the Lexus RX became the first luxury crossover with an available hybrid powertrain. Ever since then, Lexus has done its best to keep its popular hybrid crossover current. The most recent effort toward that end will be appearing in showrooms late this summer, the all-new 2016 Lexus RX 450h. Like it’s non-hybrid RX sibling, the 350, the 450h underwent a major redesign this year with significant changes to the exterior, interior, powertrain, chassis, suspension, and safety systems. The new look starts in the front end with a massive spindle grille that has become a staple for new Lexus vehicles. That gaping maw is filled with vertical bars on the RX 450h, compared to the mesh used on the RX 350. 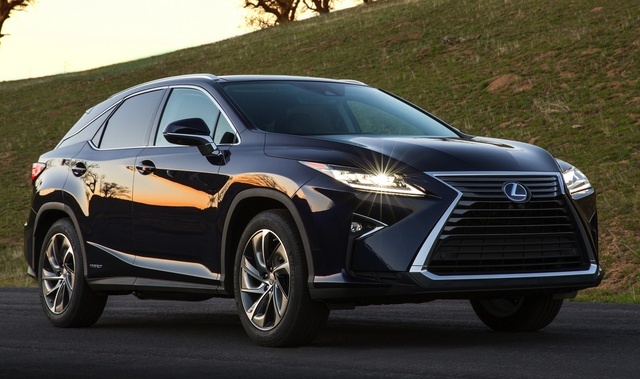 The front bumper, headlights, fog lamps, and front fender flares have also been redesigned, giving the new RX 450h a more aggressive and angular look, though the lines aren’t quite as sharp as those on the Lexus NX. The side styling creases on the RX 450h have also become more angular, and the C-pillars are now blacked out. The rear has a sharper look, too, and the taillights are a touch wider, but the profile and back end bear a strong resemblance to the outgoing RX models, which is definitely not the case for the front end. Apart from the grille, the main difference between the RX 450h and the RX 350 lies under the hood, of course. The RX 450h gets an Atkinson-cycle 3.5-liter V6 that’s based on the enhanced 3.5-liter V6 in the RX 350. The 450h engine combines with an electric motor generator to produce “around 300 horsepower,” according to Lexus, which would be an increase of 5 ponies from last year’s model. That power is sent to the front wheels with an updated 8-speed automatic transmission. Mileage numbers haven’t been released for the 2016 RX 450h, but last year’s front-wheel-drive version got 32 mpg city/28 highway/30 combined. An all-wheel-drive 2016 RX 450h, with an additional electric motor to power the back wheels, is expected to arrive in showrooms in late 2015. Last year’s AWD models got 30/28/29. The chassis (based on the current Toyota Highlander's) has been enhanced to improve control in corners and on straightaways. The handling gets an extra boost from a re-tuned suspension system (MacPherson struts in front, double-wishbone setup in back). An Adaptive Variable Suspension is now available for the RX 450h for the first time. That system monitors the shocks and steering and makes automatic adjustments to deliver the best possible drive. The AVS comes standard if you opt for the F SPORT package, which will be available on the RX 450h for the first time this year, at least when the AWD versions come out, since F SPORT is available only with AWD. In addition to the AVS (which allows the driver to switch between Eco, Normal, Sport, and Sport+ driving modes), the F SPORT package adds an active stabilizer system that helps keep the vehicle flat in corners, 20-inch alloy wheels with a graphite finish, F SPORT badges on the front grille and rear bumper, a unique instrument cluster, and a sport steering wheel with perforated leather trim, paddle shifters, and an F SPORT emblem. The interior doesn’t get the same dramatic facelift as the exterior, but there are some changes. There’s more legroom for rear occupants thanks to a wheelbase that’s grown by 1.9 inches and an overall increase of nearly 5 inches in length. Rear passengers might also enjoy the newly available heated outboard rear seats, new 11.6-inch monitors mounted on the back of the front headrests for the rear seat entertainment package, and a 60/40-split power folding second row. Other new options for the interior include a retractable power panorama moonroof, a color head-up display, and a 12.3-inch screen for the infotainment systems. That’s not a touchscreen, however, as the RX 450h stays old school with the control knob, much to the delight of some critics. The RX 450h is loaded with safety features, including the new Lexus Safety System+, which is based on Toyota’s Safety Sense package that was introduced with the 2016 RAV4 Hybrid. The Lexus Safety System+ conveniently bundles several of the existing safety systems like lane-departure alerts, automatic high beams, and the pre-collision system, which is designed to detect sudden stops by the vehicle in front of you and can automatically engage the brakes. Other optional safety features include an Adaptive High-beam System, a Panoramic View Monitor, and blind-spot monitor with rear cross-traffic alert. What's your take on the 2016 Lexus RX Hybrid? Tintinnabulation With respect to the exterior changes, I find it extremely unattractive. I have owned 2 RX 450h's and been quite happy with them, but I can't buy a car that looks like this! Also, one complaint I have with my current RX is poor rear window visibility. It appears to have gotten worse in the 2916 rather than better! jrfiero The 450h doesn't have "an updated eight-speed," it has a CVT. Have you driven a 2016 Lexus RX Hybrid?